Swiss manufacturer Tudor is famous for offering excellent luxury watches at affordable prices. Top models, such as the column-wheel chronograph Black Bay Chrono, have won international awards and are among the crème de la crème of horology. Wristwatches from Tudor are highly coveted by watch enthusiasts. This is true for both their current and vintage models. Since its foundation, Tudor's main focus has been on high-quality craftsmanship and using precise movements. They have long since stepped out of Rolex's shadow and have been creating luxury watches at a level on par with the world's most famous watch manufacturers. Watch fans know they are getting a first-class timepiece with outstanding value for money if they purchase a Tudor. This makes Tudor watches a good entry point into the world of luxury watch collecting. Pre-owned and rare vintage watches are so popular among collectors today that the prices have risen drastically in recent years. A timepiece that would have been a bargain in the 1980s now often costs several thousand euros. A highlight from the current catalog is the Heritage Black Bay Chrono, which was introduced by Tudor at Baselworld 2017. It immediately went on to win the "Petite Aiguille" ("Little Hand") prize at the 2017 Grand Prix d'Horlogerie de Genève. This column-wheel chronograph with a retro design is powered by the in-house movement MT5813, which has a 70-hour power reserve and has been certified as a chronometer by the Official Swiss Chronometer Testing Institute (COSC). In line with current trends, the Heritage Black Bay Bronze is a bronze watch that will develop its own unique patina over time. This 43-mm diving watch also has an in-house movement, but lacks chronograph functionality. The caliber MT5601 also runs for three days when fully wound. Thanks to the silicon balance spring, this movement is anti-magnetic in addition to being extremely accurate and certified by COSC. How much do Tudor watches cost? Prices for Tudor watches range from a few hundred euros for mass-produced, pre-owned vintage watches to around 30,000 euros for a rare Tudor Submariner with the reference number 7928. 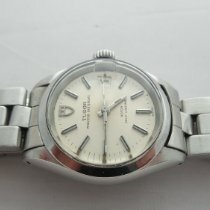 This watch was launched in 1959 and was in production for over ten years. It was the first Tudor diving watch with a crown protector. 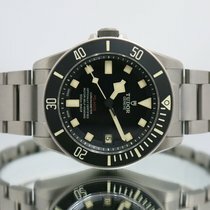 Tudor's first diving watches from 1954 have the reference number 7922 and are very hard to come by. An extremely rare ref. 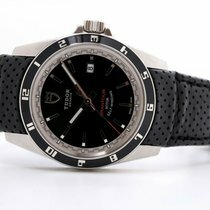 7923 was bought at auction for 99,999 USD in 2017, placing it among the most expensive Tudor vintage watches to date. The 7923 was the only Tudor Submariner with a manually-winding caliber, making it especially flat. Early chronographs from the 1970s are just as desirable and can cost up to 20,000 euros. Current top models are considerably more affordable than the rare vintage watches. For example, you can purchase a mint-condition Tudor Heritage Black Bay Chrono with a steel and textile band starting around 3,800 euros. The version with a leather and textile band starts at 3,500 euros. If you don't need a chronograph, but like the line's retro design, take a look at the Tudor Heritage Black Bay Steel. The manufacturer also brought this three-hand watch with the in-house movement MT5612 to market in 2017. What sets this 41-mm watch apart is its stainless steel bezel and the date display at 3 o'clock, which had never been featured in a Black Bay watch before. New pieces begin around 2,800 euros. Tudor offers numerous retro watches with designs inspired by the manufacturer's historic models in their Heritage collection. The catalog includes diving watches that are water resistant to 200 m (20 bar), sporty and simple three-hand watches, and functional chronographs. This line only needed a few years to develop into the Genevan manufacturer's flagship collection and is especially popular among watch fans. Diving watches are generally a popular class of watches. Retro models that combine state-of-the-art technology with historic design elements are especially trendy. The Heritage Black Bay from Tudor is one of the most highly coveted retro diving watches and has had several variations since 2012. This watch is water resistant to 200 m (20 bar) and has a design reminiscent of early Submariner models from the 1950s. This is why the Black Bay has a large crown with no crown protector and curved glass, also known as "domed crystal" . In the beginning, the Black Bay was only available with the caliber 2824 from the ébauche supplier ETA, but now in-house movements are ticking away in many of this line's models. You can find pre-owned pieces with outsourced movements for as little as 2,100 euros. Models in mint condition with an in-house movement start at about 2,400 euros. When it comes to the design of the Heritage Black Bay, you have the choice between a distressed leather strap or stainless steel bracelet. Tudor even provides different versions with an additional textile band so you can change the band as you desire. For the bezel, you have the choice of red, blue, or black. If you prefer all-black watch designs, take a look at the Black Bay Dark, whose 41-mm stainless steel case and bracelet have a black coating. The hands and hour markers covered in luminous material make for a stark contrast and have excellent readability in light or darkness. The white minute markers and the bezel's minute scale also stand out against the black background. The Black Bay Dark costs at least 3,000 in mint condition. The bicolor model Black Bay S&G is also popular and is featured in many promotional photos with English ex-soccer player David Beckham. As an icon of fashion and masculinity, Beckham is the perfect brand ambassador for Tudor. The stainless steel watch Black Bay S&G is available with a bicolor metal bracelet or leather strap. As with the other models in this line, it also comes with an additional textile strap. The in-house movement MT5612 with a date display, which is also found in the Black Bay Steel, powers these watches. Set aside around 3,700 euros for a new version with a stainless steel or gold bracelet. The name Heritage Ranger makes it clear that this model is inspired by a historic watch – namely the Oyster Prince Ranger from the 1960s. The new Ranger's simple design is very similar to its historic predecessor, especially its dial. Arabic numerals are located at 3, 6, 9, and 12 o'clock, while indices are used for the other hour markers. The arrow-shaped hour hand and the skinny second hand with a luminous rectangular box on its final third bring to mind the original model from the 1960s.Rolex aficionados will notice similarities to the Rolex Explorer, which should come as no surprise since Tudor – a Rolex daughter company – uses numerous Rolex components. This includes the Oyster case, which explains the original name: Oyster Prince Ranger. A diameter of 41 mm sets the current Tudor Heritage Ranger apart from the historic watch and brings it up to modern standards. In terms of bands, you have the choice between a three-piece link bracelet, a brown leather strap, or a cuffed band with a leather underlay. Each variant also includes two textile straps. Due to its sporty and simple design, the Ranger is appropriate for almost any occasion and coordinates with almost any outfit. For these watches, Tudor decided on the proven ETA 2824 caliber. Pre-owned models can be found in good condition for less than 1,500 euros. If you'd prefer to buy a new watch, be sure to have at least 1,800 euros available. The Heritage Chrono is a retro chronograph with a look inspired by the early Tudor Oysterdate Chronographs from the 1970s. A striking feature of the current model is the colorful dial that nods to the 70s. The Heritage Chrono Blue feels especially fresh with blue subdials and a blue edge around the dial. Tudor uses the automatic ETA caliber 2892 with a chronograph module for this watch. You can measure times of up to 45 minutes with this movement using the dial at 9 o'clock. The small seconds dial is located at 3 o'clock, and you can discern the date in a small window at 6 o'clock. With the help of the bi-directional bezel with 12-hour graduation, you can also keep track of a second time zone. Prices for the Heritage Chrono Blue begin around 3,300 euros for watches in mint condition. Tudor tool watches endeavor to be scientific instruments with a modern look. The so-called "tool watches" include the Pelagos and the North Flag, which have begun to feature in-house movements and are regarded as robust and reliable. The diving watch Pelagos is made of light and durable titanium and is water resistant to 500 m (50 bar). It is available with a black dial and bezel or a blue dial and bezel. The crown of the LHD model ("Left Hand Drive") is on the left side and is geared toward left-handed customers who like to wear their watch on their right wrist. Thanks to the helium escape valve, the Pelagos is also suitable for professional saturation diving. The helium escape valve prevents any damage from excess pressure building up during decompression. The patented folding clasp on the titanium bracelet is ideal for divers since it automatically adjusts the bracelet's length to the size of the wetsuit. When the pressure increases underwater, the wetsuit is compressed and the band shortens. As pressure is released, the suit expands and the band lengthens. Every complete set also includes an additional rubber strap. A pre-owned Tudor Pelagos diving watch costs around 2,500 euros, while those in mint condition start at 3,000 euros. The understated North Flag is inspired by the reliability of Tudor watches worn by participants of the British North Greenland Expedition in the 1950s. The stainless steel case on the 40-mm North Flag is entirely satin-brushed and has an angular design, underlining its scientific nature. The double bezel made of stainless steel and ceramic integrates seamlessly with the design of this functional watch. The in-house movement MT5621 is certified as a chronometer, shows the date at 3 o'clock, and features a power reserve display at 9 o'clock. You can buy pre-owned models starting around 2,000 euros and models in mint condition for 2,300 euros. Motorsport is the inspiration for the Tudor tool watches Fastrider and Grantour. Unsurprisingly, the majority of these watches have a chronograph function. There is even a Grantour with a flyback function, which shortens the process for measuring time. The caliber 2829 with a flyback chronograph module is responsible for the precise timekeeping. Examples in mint condition sell for around 3,000 euros. If you can do without these convenient features, perhaps a Grantour Chrono with the ETA caliber 7753 is the right choice for you. You can buy one of these watches starting at 2,500 euros new. The Grandtour Date is a three-hand variant powered by the ETA caliber 2824 and is even more affordable. Models in mint condition cost about 2,000 euros. With its yellow, red, or green dial, the Fastrider is one of the most eye-catching watches from Tudor. The matte-black ceramic bezel and satin-brushed case highlight this chronograph's technical appearance. The pushers and crown are coated in black to match the bezel. Similar to the Grantour Chrono, Tudor utilized the automatic chronograph caliber 7753 in the Fastrider. This caliber has a power reserve of 46 hours and a date display at 4:30. Occasionally and with a bit of luck, you may find a pre-owned Fastrider in very good condition for less than 2,000 euros. The prices for models in mint condition start around 2,400 euros. If you prefer the all-black Fastrider Black Shield model, plan to spend at least 2,800 euros for a pre-owned watch and at least 3,000 for a watch in mint condition. In addition to numerous retro and sports watches, Tudor also offers classically elegant women's and men's watches, which match especially well with a business suit or evening wear. The Style collection is made up of simple three-hand watches with designs reminiscent of traditional wristwatches from the 1950s through the 1970s. A majority of the watches are made of stainless steel, though there are also bicolor variants in stainless steel and yellow gold. For the bands, Tudor utilizes leather, stainless steel, and steel and gold in their bicolor variant. The case diameters currently range from 28 mm to 41 mm, meaning there are watches suited for both men and women. Medium-sized models from 34 mm to 38 mm are also suitable as unisex watches. You can purchase a stainless steel Tudor Style in mint condition with a leather strap for as little as 1,600 euros. If you have your eye on a mint-condition bicolor model with a metal bracelet, you should set aside around 2,300 euros. Tudor sells glamorous women's watches in their Glamour series. Highlights from this line have 11 diamonds for the hour markers and a diamond encrusted bezel. One of these bicolor watches is 31 mm in diameter and costs about 4,300 euros. Men's watches include the 39-mm Date-Day, whose day display at 12 o'clock is reminiscent of the Rolex Day-Date, and the 42-mm Double Date with a large date display beneath 12 o'clock and a small seconds dial at 6 o'clock. You can buy the latter in mint condition starting at about 2,000 euros. You can get a new Date-Day for only 1,700 euros. A pre-owned Rolex Day-Date costs at least 4,600 euros, while one in mint condition costs around 15,000 euros. The Classic is yet another classically elegant Tudor collection featuring watches in various sizes for both men and women. The current 41-mm model contains separate day and date displays, as seen in the Date-Day, and has top models embellished with diamonds. The 28-mm women's watch also has diamonds. Most watches have a metal bracelet, which is also available in a bicolor variant. Some versions have a ridged yellow gold bezel and a stainless steel case. 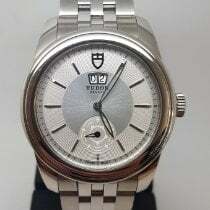 A new stainless steel Tudor Classic costs around 1,800 euros, whereas bicolor versions with diamonds are around 5,000 euros. Tudor's beginnings reach all the way back to the year 1926. Rolex's founder Hans Wilsdorf was responsible for founding the Genevan company. Wilsdorf's goal from the beginning was to manufacture reliable watches that were more affordable than the comparable Rolex models. To achieve this, original Rolex parts, such as the Oyster case or Oyster band, were used for many years. For their movement, Tudor relied on less expensive alternatives from suppliers like ETA, which still supplies them to this day. However, movements developed in-house and manufactured in Genevan production halls have been used since 2015. The brand name Tudor is taken from the eponymous royal family, which sat on the English throne from 1485 to 1603. The logo is the Tudor rose from the family crest, which was later framed by a shield. Together they symbolize the unity of strength and aesthetics. 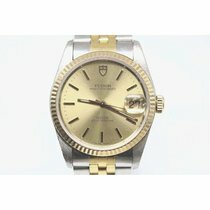 Today, the shield and the inscription "Tudor Geneve" embellish the dials of both women's and men's watches.